Senna flowers Easter sennais the Latin form of the Arabic word sanā for a thorny bush; pendula is from the Latin pendulus, hanging. This is a spreading, evergreen shrub to small tree, up to 4 m high with a rounded, densely leafy crown and arching branches, native to South America, in particular Brazil, Peru and Paraguay; long cultivated as an ornamental in other countries, it has escaped cultivation and become naturalized in the Madeira Islands, South Africa, Australia, Hawaii, the Bahamas, Florida, Texas and California, especially in waste places. In Australia, it is mostly found in the coastal regions of southern Queensland, and right down the NSW coast as far as Sydney. 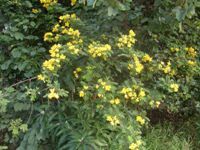 It has now reached noxious weed status in many places, especially in the USA and in NSW. It seems that the entire population of the plant blooms simultaneously, so that there is a loud shout of yellow over a wide geographical area for a period of 20-60 days, depending on the conditions. Although it makes a brave sight when it it is in flower (around Easter in the southern hemisphere, as its common name suggests), it scrambles over and competes with indigenous species, and can be poisonous to stock. pods & folding leavesIt appears to be spreading quite rapidly in Australia. In 2013 it had a bumper year on the Sunshine Coast and its hinterland in southern Queensland, and in Sydney suburbia, where, in full flower, it was highly visible from train windows when I visited at Easter. 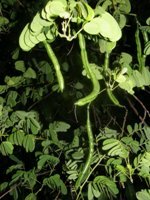 The leaves are alternate, and paripinnate, 4-8 cm long with 3-6 pairs of leaflets. The closer the leaves get to the end of the branch, the smaller they become. The leaflets become larger the further out they are on the petiole. The leaflets are obovate, with a rounded apex, and are about 2-5 cm in length, 1-1.5 cm in width. There is a gland between the lowest pair. The petiolules are short, only about 1 mm in length. The leaflets on opposite sides of the leaf petiole come together at night, i.e., the leaflet folds up. In the inflorescence, the peduncles are 3-4 cm in length. 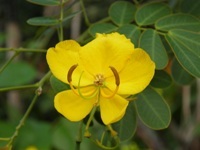 The bright yellow flowers, 3-12 blossoms in each raceme, are almost 1.5 cm wide, with 4 more-or-less oval petals, and a larger heart-shaped fifth petal. There are 2 well-developed stamens, and what looks like an extra sterile stamen, and a curved style. The prominent pair of stamens ‘point’ towards the fifth, heart-shaped petal. The flowers are slightly nodding and slow to open fully. The mature seed pods are brown to straw-coloured, cylindrical, partially segmented, and up to about 15 cm long by about 1 cm in diameter.